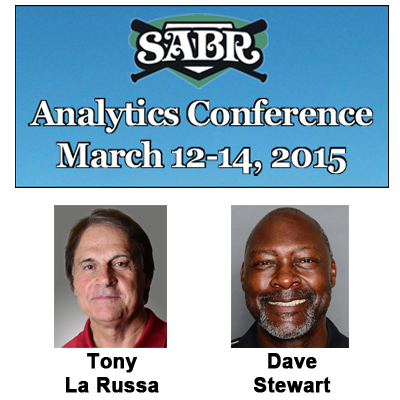 We're pleased to welcome Arizona Diamondbacks executives Tony La Russa and Dave Stewart as featured speakers at the fourth annual SABR Analytics Conference, which will be held March 12-14, 2015, at the Hyatt Regency Phoenix in downtown Phoenix, Arizona. Conference registration is available now at the SABR Store. Click here to register. The conference is open to all baseball fans. Stay tuned as more featured speakers will be announced soon! La Russa is the Chief Baseball Officer of the Arizona Diamondbacks. He joined the Diamondbacks front office in 2014 following a Hall of Fame managerial career in which his teams won three World Series and six pennants. He finished his 33-year career with 2,728 victories — the third-highest total in baseball history — and he was honored four times as Manager of the Year. He led the Oakland A's to the 1989 World Series title and the St. Louis Cardinals to championships in 2006 and 2011. He was elected to the Baseball Hall of Fame in 2014. Stewart is the Senior Vice President/General Manager of the Arizona Diamondbacks. He was hired as the Diamondbacks' GM in September 2014 following a dozen years as a player agent and a 16-season major-league career as one of the top pitchers in baseball. He was a member of the Los Angeles Dodgers' 1981 World Series championship team and had stints with the Texas Rangers and Philadelphia Phillies before moving on to Oakland, where he won at least 20 games in four consecutive seasons, leading the A's to three American League pennants from 1988-90. He was the World Series MVP in 1989 and pitched a no-hitter on June 29, 1990. He was also a two-time ALCS MVP with the A's in 1990 and the Toronto Blue Jays in 1993, when he was part of a third World Series-winning team. He spent time as a major-league pitching coach and front-office executive before forming his sports agency in 2002. For more information on the 2015 SABR Analytics Conference, or to register, visit SABR.org/analytics. This page was last updated January 16, 2015 at 12:09 pm MST.